St John’s Methodist Church is part of The Church in Loddon. The Methodist and Anglican congregations formed a Local Ecumenical Project thirty years ago. Worship is united. Morning Worship 10.45am each week. New Expressions worship on the first Sunday of each month at 4pm is an interactive, workshop activity time ending with All age Worship. Festival Services and Summer Worship is held in Holy Trinity Church. We meet at St John’s Nov – March. 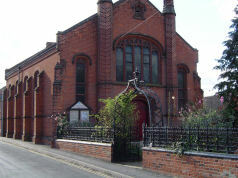 The Catholic congregation use the Methodist Church; Mass 11am each week. Ministers; Rev Ernie Bosse, Rev David Owen.